The small Calore Lucano river in the province of Salerno (not to be confused with the larger Calore river near Benevento) flows into the larger Sele river just west of the Alburni massif (image here) near the town of Serre in the province of Salerno at the western end of the Vallo di Diano and Cilento national park.The wedge-shaped area formed as the two rivers converge is called Persano and has historically been an area known for its natural beauty and biodiversity. The name "Persano" technically refers to a very small town, originally a medieval village, but generally, these days, "Persano" means the area. It is today the site of the Romga Barracks (photo, right), a large military installation of the Italian army and is located at the end of a long road still named for Gioacchino Murat after the Bonaparte king who ruled the kingdom of Naples in the very early 1800s. The area is also the site of one of the world's large solar cell installations and what they tell me is one of the largest golf courses in Europe, still under construction. (When it is finished it will even have a par 6 hole, just in case that gets your golf juices flowing!) From large to larger and largest, and I almost passed right by it all because I was on my way to see another impressive site, the World Wildife Fund Oasis of Persano. Persano came into prominence when it was declared a "Royal Site" by the Bourbons of Naples, the new dynasty that took over the kingdom in 1735. One hears of the well-known Bourbon royal sites in or near Naples, itself--the royal palaces such as the main one in the city, or the others out at Portici, at Capodimonte, and Caserta, but one should not overlook the smaller "hunting lodges", often termed in Italian a casina reale. The term, indeed, mean "little house," but these are not one-room cabins, "little places in the country," where the royals had to elbow one another for space around the one pot-bellied stove or pot-bellied king in the center of the room. These lodges were sumptuous, quite large and designed by name architects of the day. Many of them were abandoned and fell to ruin over the years after the unification of Italy when the Kingdom of Naples ceased to exist (1861), but a few of them have been kept up or, more likely, later restored, such as the lodges at the Astroni (currently under a 2011 contract to be restored) or Lake Fusaro near Naples. Some are in a kind of urban limbo, semin-abandoned, semi-used...no one seems to know (such as the lodge at Carditello, near Caserta.The Casina Reale at Persano is one of those that has been kept up and used for modern purposes. It is not well-known even to the Italian public, much less foreign visitors, certainly because it houses an Italian army unit. You can't just walk in and look around. This Casina Reale was originally built between 1752-4 by Giovanni Domenico Piana (1708-1769), a military engineer from Milan. It was rebuilt almost immediately by the great Luigi Vanvitelli. It was built to a rectangular design on two floors, with a splendid arcade around a central courtyard and octangular towers set at the four corners. It had everything to meet the needs of a royal family and guests--a chapel, servants quarters, and stables. In its day (the late 1700s) the Persano royal residence was spectacular and a part of the Grand Tour, drawing many Northern Europeans to venture south of Naples, including the Czar of Russia, Goethe and Metternich. (That is hardly surprising, considering how close Persano was to the newly discovered archaeological wonders of Paestum.) The Persano Casina was decorated with the art of such as Jakob Philipp Hackert, Francesco Celebrano, Salvatore Fergola, as well as a marble statue attributed to Antonio Canova. Some of the art work is still on the premises in the barracks chapel of S.Maria delle Grazie. Much of the rest has been removed to galleries in Naples, Caserta or Capodimonte and even abroad. Today, as noted, the old Casina Reale is a military barracks and may be visited by the public only on rare days of "open house" or by joining an organized tour. Persano is also well-known as the home of the Royal Stud. (That is not a reference to Charles III, the first Bourbon king of Naples, although he did sire 16 children!? Perhaps Royal Horse Breeding Facility, or something like that, is more appropriate.) 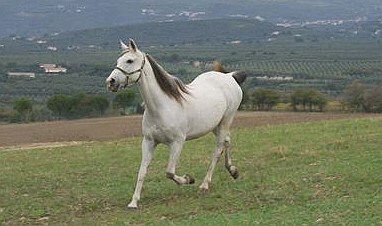 It was the home of the Persano horse, a breed created to look like the Anglo-Arabian horse and created by crossing Andalusians, Arabians, Persians and Mecklenburgers. The stud farm at Persano was started in 1742. *note The Persano breeding herd was largely neglected following the unification of Italy; indeed, in 1874 breeding of the Persano was officially abandoned and remnants of the species were sold at auction. In 1900 the breed was reconstituted to a certain extent according to the needs of the Italian cavalry. The claim is made that horses of this breed were part of the last successful cavalry charge in modern warfare when the Italian cavalry employed them against Soviet infantry near Isbushensky in WWII in August of 1942. Throughout WW II Persano remained one of the two facilities in Italy that raised and provided war horses to the Italian army. In 1972 the breeding facility at Persano was closed definitively and the remaining 246 horses were transferred to the other facility, the Italian Military Veterinary Center in Grosseto in Tuscany. That center supplies horses, including the Persano (now also known as the governativa--government--breed) to ceremonial as well as working mounted units of the Italian armed forces. Nevertheless, the status of the Persano breed was listed in 2007 as critical by the Food and Agricultural Organization of the United Nations. There are, however, a number of private stables in the area of Persano that maintain some of the horses and there is intense interest in saving the breed. update - June 4, 2018 --Also see this item on the breed known as the Napoletano.